So when he saw me, he would run into my arms saying, “Chicago! My Chicago’s home!” It was. Absolutely. Precious. There are so many memories of wonderful times with Nick, going to restaurants, doing fun things around Kansas City, Thanksgivings, Christmas Eve’s, other birthdays, a few trips we took together and so much more (you can read about many of them here). Now he’s all grown up and working in a job where he travels to London several times a year. Yes, he’s been grown up for awhile, but something about him turning 30 sort of made it official for me. He’s become very successful, a “continental traveler” and he’s now a wonderful Uncle himself (with my new great niece Laura, now six months, but that’s another blog post in the making!). I love discussing business with him, he’s like a professional confidant. He’s smart. He’s good looking. He’s sweet. He’s funny. 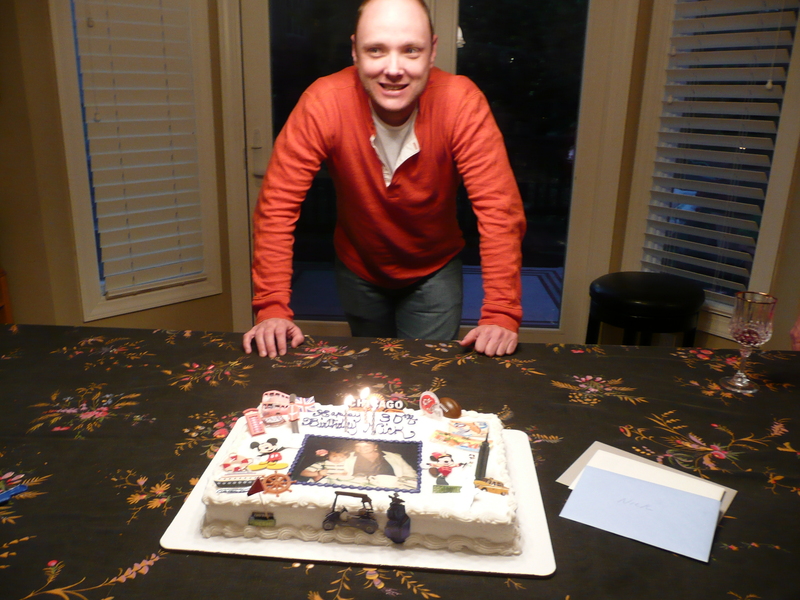 Last night everyone came over to the house to celebrate his 30th Birthday. Here’s a picture of his cake I had made. On it is a picture of him and my Mom, and a few iconic symbols of some of the things I love about Nick, places he’s been, things he does, places we’ve been together. He’s off again this coming weekend for a couple of weeks to London, with a possible side trip to Dublin or Paris. They do grow up so fast, time does fly, so do treasure them all you can. Happy 30th Nick, I love you and am so proud of you! This blog captured me. I am doing my best to enjoy my nieces and nephews. Luckily I have more than what I can handle :) The youngest girl, who is just a doll, loves when I come home to see her. I dread the moment when they leave our town but for now, as you mentioned, I must treasure those moments.